Little brown bats were once among the most common kinds of bats in North America. But by 2013, their population had dropped so low that scientists wondered whether they should be listed as endangered species. This story begins in 2007, when a team of scientists from the NY State Dept. of Environmental Conservation goes to a cave near Albany. Their job: to count hibernating bats. What they found were lots of dead bats, some with fuzzy white noses. The following year they found even more dead bats. What was killing the bats? Was it climate change? Pesticides? A virus? 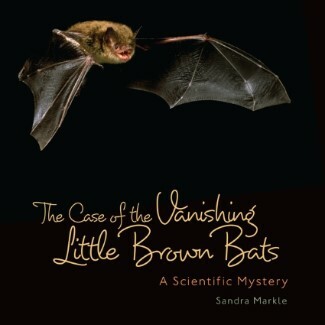 In this book, Sandra Markle follows a team of scientists working on the bat-killer mystery. She follows them into caves and into their labs. The scientists determine that the killer is a fungus – but they still have more questions: what will happen to the populations of other animals that depend on the bats? Some animals rely on bats for their suppers, and farmers rely in bats to control crop-munching insects in the ecosystem. Markle provides amazing bat facts and lists ways people can help their local bats. She’s also got a long list of books and other resources for folks who want to explore bats more deeply. 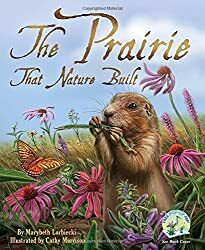 Booktalk: A wild prairie is a lively place in this rhythmic romp with munchers and crunchers above and below the grasses so thick, and fires that flare, and rains that quench—and always the prairie grows green. Back matter offers information and activities for a fuller appreciation of this marvelous, disappearing habitat. When rain you want still stays away. See the book in 3-D by downloading the app. This week’s Poetry Friday Round-up is hosted by TeacherDance. 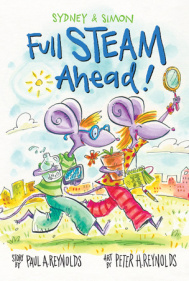 Sydney and Simon: Full Steam Ahead! Sydney and Simon are an intrepid pair of twin mice who are preparing for a flower show. They have a high hopes for first place but a big problem blooms when a heat wave dries up the soil in their window box. Why can’t they just pour water in the box? Their apartment window is stuck and not budging. Time for the wonder twins to get STEAMed (Science, Technology, Engineering, Math, Arts, and Math) up. Sydney starts by drawing pictures of the wilting flowers and concentrating on creating a hypothesis for the stuck window. Simon has his tablet focused on finding solutions. With the help of their mom, the twins start thinking about water vapor and an investigation is launched. In the process of trying to create a watering device for a small space, Sydney and Simon discover a leaky faucet that leads to an investigation of water use. The mice use many resources including their science teacher and Uncle Rusty, who works for the water department, to learn more about wasted water. One of the great things about this book is how readers get to see two characters constantly thinking and being determined to solve problems. There’s no giving up with these two mice. Sydney and Simon’s actions will ring true with young readers because they are excited about every discovery and this is how kids react as well. Watching kids at recess or with a science experiment will teach you this. I love how all of STEAM is woven into the story without it becoming stilted and boring. The artwork is full of bright colors which makes this a fun read. I hope the Reynolds brothers will bring us more Sydney and Simon adventures because we need kids to get STEAMed up! This week the AAAS/Subaru SB&F announced their 2015 nominations Prize for Excellence in Science Books in the children’s, middle grade, and hands-on categories. Here are some of the nominated titles that have been featured at STEM Friday. Sue (Archimedes Notebook) reviewed Handled with Care by Loree Griffin Burns and with photographs by Ellen Harasimowicz in May. 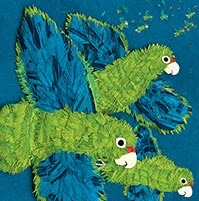 Shelf-employed highlighted Parrots Over Puerto Rico by Susan L. Roth and Cindy Trumbore in January, and Louise featured it in November, 2013. There are some wonderful titles this year. See a complete list of the nominated books and my reviews at Growing with Science blog. This is a book about one gorgeous beetle (look at the beautiful antennae), the damage it does to forests, and the scientists and citizens who are trying to save their trees. The Asian Longhorn Beetle, also known as the ALB, came from China tucked into wood used to ship products to the US. Now it’s infesting trees from Massachusetts to New York and into Canada, and foresters are in a race to control its spread. But is cutting thousands of trees the answer? 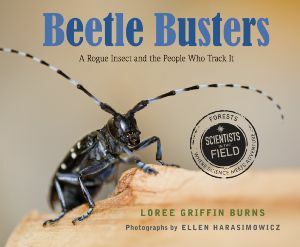 In this book Loree Burns takes a close look at the beetle – its life cycle inside and outside the trees – and the scientists tracking the insect. She talks trees: bark, tree rings, leaves and buds. She takes us into the woods with the beetle busting team for some surveying and a bit of tree climbing (don’t worry; we’re roped in), then into the lab. Beetle busting is hard work, and the scientists need help. That means we – yes, just ordinary citizens – need to help track and report beetle break-outs. Even if it means losing a tree we love. Burns includes diagrams, sidebars, author’s notes and resources for curious beetle naturalists. 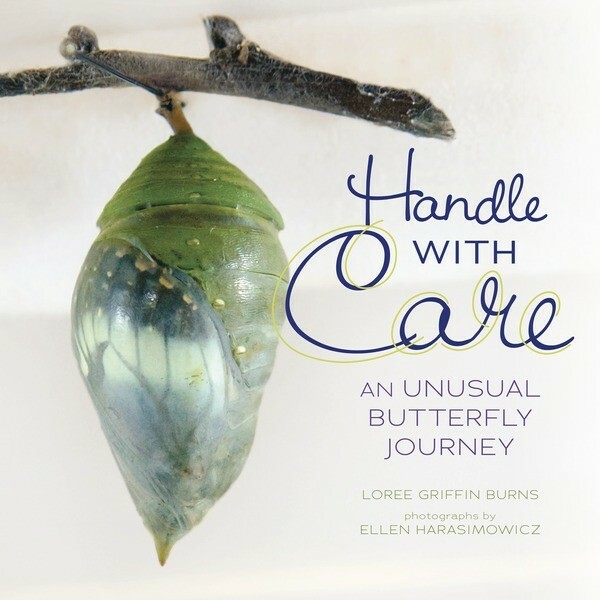 Ellen Harasimonwicz’s photographs are integral to this book. She traipsed from field to lab and her photos of beetles, trees, and scientists in action help us understand the complexity of the problem. Head over to Archimedes Notebook for an interview with Loree. She talks about her research and what kids can do to help scientists bust these beetles. 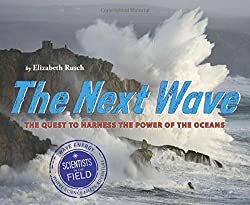 Booktalk: Journey to the wave-battered coast of the Pacific Northwest to meet some of the engineers and scientists working to harness the punishing force of our oceans, one of the nature’s powerful and renewable energy sources. With an array of amazing devices that cling to the bottom of the sea floor and surf on the crests of waves, these explorers are using a combination of science, imagination, and innovation to try to capture wave energy in the hopes of someday powering our lives in a cleaner, more sustainable way. A great deal of energy generated around the world is lost from resistance in wires when transported long distances. One of the benefits of ocean energy is that electricity can be generated–and used–near where people live. More than half the U.S. population lives near the coast and more than half the world’s population lives within 125 miles (200 kilometers) of the ocean. What I love about science is that it is accessible to anyone. Any interested student can observe the world around them, create theories and test those ideas. Wendy Macdonald’s Galileo’s Leaning Tower Experiment, illustrated by Paolo Rui, is a picture book that invites readers into that world of observation. Here, learning science is not some foreign, exclusive club that only a chosen few get to study, rather, readers, both young and old, can participate. Galileo’s Leaning Tower Experiment is about a young, fictional, boy name Massimo, who is interested in the speed at which things fall. He meets Galileo, a professor at the University of Pisa in 1589, and the two work to figure out if Aristotle’s previous theory was wrong. Legend has it that Galileo dropped things off the Leaning Tower of Pisa to prove his new theory, which displaced Aristotle’s old theory. It is this event that the picture book centers on. But throughout the book, as Massimo and Galileo theorize, experiment, and make deductions, they show the reader how science works. It’s this progression of deductive thinking that makes this book resonate as more than just a recounting of an old story. This is what a nonfiction picture book should do, engage children (or us older readers) so that they feel they are not being preached to, or lectured, or bored by irrelevant historical information. Macdonald is highly successful with that. In the course of 32 pages, the characters drop many things to compare their speed. By the end, I got up and started dropping things. Just so I could participate too. Copyright © 2014 Amanda K. Jaros All Rights Reserved.